I think you’d be hard pressed to name a celebrity more beloved than Steve Martin. More than an “A lister,” he’s one of those people you can’t imagine a world without (nor would you want to!). In fact, I hope he outlives me. And there’s seemingly no end to the things he does really, really well. A master actor, entertainer, magician, writer, storyteller, songwriter, comedian, and – last but certainly not least – banjo player, he’s clearly one of the most talented humans walking atop our spinning blue rock. Readers of this series know that I would agree. Because what he means by this is that he wasn’t born with the skills needed to become great at all of those things, he acquired them. He got good at a lot of things because he’s good at getting good at things. I recently had the pleasure of listening to his memoir “Born Standing Up,” which recounts the early days of his career as a stand up comedian. In addition to being entertaining, funny, and, at times, poignant, it’s also an illuminating look at why he’s so good at getting good. And while the book contains no banjo instruction, it is nonetheless rich with lessons that are applicable to anyone trying to learn to do anything well, including banjo pickery. Brainjo Law #1: To learn to play like the masters, we must learn to play like the masters. LESSON 1: Seek feedback relentlessly, and modify accordingly. Feedback is essential to the learning process. In fact, the fundamental learning loop can be described as practice –> feedback → modification → practice → feedback…and so on. Increase the frequency and quality of feedback, and you accelerate the learning loop. Positive or negative, feedback is always valuable information. Yet, most folks are apprehensive about subjecting their abilities to public scrutiny, lest they risk an unfavorable reaction. For Martin, though, bombing on stage wasn’t viewed a personal failing, but a necessary and invaluable opportunity for growth. And so he sought out time on stage whenever he could get it. His objective was never to show everyone how funny he was, but to find out how he was doing. Each session in front of an audience was an opportunity to collect data and get better, and learning was more important than praise. Acquiring feedback is just the first step, however. The key is to then use that information to modify the thing you’re trying to learn. Which is exactly what he did. Martin kept detailed records of every joke and gag, and how they landed with the audience. He’d then take the data from those performances and write out a plan for how to make his act better the next time. Regardless of what you’re learning, treat the process as a scientist would. Every practice session or performance is an experiment, a chance to test your hypothesis, rather than a referendum on your self worth. If the results indicate the hypothesis is incomplete or wrong, then it’s back to the lab to devise a new one. Learn to love this iterative process above all else, and continued progress is guaranteed. Brainjo Law #6: There is no failure, only feedback. LESSON 2: Seek out sources of inspiration, and study them in depth. Martin cites many influences along his rode to mastery. During his time working at the Main Street Magic shop at Disneyland, for example, he was drawn to the act of Wally Boag, the headliner at Disney’s Golden Horseshoe Revue. But his role models and mentors were more than just sources of entertainment and inspiration. They were the subjects of intense study. Martin meticulously analyzed and memorized the nuances of Boag’s routine, to the point where he could re-enact his act verbatim. Nobody gets better in a vacuum, and I think its hard to overstate the value of seeking and studying the heroes you wish to emulate, especially in the formative stages of your journey. It’s no coincidence this is a theme in every master’s story. For the banjo player, this means identifying the banjoists whose playing speaks to you most, and studying them. Study their music, study how they play, what they say, and how they learned. Brainjo Law #19: Pay close attention to other players that make you FEEL something, and study them. LESSON 3: Believe you can become anything. Perhaps the biggest learning lesson in the entire book, which is also the overriding theme in all of Brainjo, is that, thanks to a brain that continuously changes throughout your life, you can reprogram yourself into what you want to become. So getting good at the banjo, or anything else, has nothing to do with natural ability. That just determines where you start. But getting good at the banjo has everything to do with HOW you learn, or how you go about reprogramming your brain. That’s what determines where you end up. And this is why I loathe the concept of natural talent. Not just because it isn’t useful, but because it leads so many to never live out their full potential. Without a firm belief in our capacity to continue to grow and improve, we’d never have the courage to pluck that first banjo string, or hop on stage for the first time. Nor would we have the courage to soldier on in the face of negative feedback. If our abilities are fixed, then better to remain silent and be thought of as “funny” or “musical” than to perform and remove all doubt. Had Steve Martin bought into the talent myth, we’d never seen the likes of Navin R. Johnson or Lucky Day. We’d have never added the phrases “I’m a wild and crazy guy” or “excuuuuse me” to our collective vocabularies. Our ears would’ve never been graced by the sounds of The Crow or Rare Bird Alert. Had he bought into it, there’s no telling how many millions of hours of laughter and joy the world would’ve lost. By the way, the book “Born Standing Up” is outstanding, and hopefully this post has whetted your appetite. The audio version is particularly excellent, as it is narrated by Martin, and contains his banjo playing interspersed throughout the recording. Josh, great article and summary of Born Standing Up. 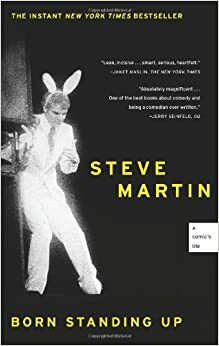 I also read that book and I am a huge Steve Martin fan. In addition to being a terrific banjo player, he is a gifted songwriter. My favorites include: The Great Remember, Clawhammer Medley, Daddy Played the Banjo, Me and Paul Revere, and on and on. I first picked up a banjo at age 65 (now 71), and I appreciate your emphasis in loathing the term ‘natural talent’. Had I bought into that canard I would never have even tried. Keep up the good work. My big takeaway is that authentic feedback promotes authentic opportunity to learn. Thanks for the post! WOW! I’m not alone. Another who picked up the banjo in her 60’s with no experience on a string instrument. Wonderful, Ray. It is a uniquely satisfying kind of music, isn’t it. I have just picked up the banjo at age 69 always loved bluegrass. Also a big fan of Steve Martin. I started the breakthrough banjo course, and I am glad I did. it is slow going for me due to limited feeling in my hands. Thanks Josh. That’s fantastic, Robert. Fast or slow, it’s the ride that matters! I’m a person with a lot of raw musical talent. I play several instruments well having put in very little effort. I agree with Josh that talent isn’t the answer. In fact, I would go so far as to say that talent can be an impediment to greatness because those of us who don’t have to work very hard to be “good” are less likely to put in the work to transition from good to great. So, if it doesn’t come easy for you, count your blessings. You’ll be more likely to do the “push ups” you need to do to become a great player. That’s a very interesting perspective, Patrick. There are certainly many in the course of history who’ve used their lack of “raw talent” as motivational fuel. I am a claw hammer player that struggled for years. I enjoyed complex melodic playing but that was not a good fit for my actual playing on the ground. When I completely abandoned banjo tab and started listening I suddenly took off. My playing became much simpler, strongly rhythmic and based off of chords which I learned to make up and down the fret board. I would get simple printed standard notation versions of the melodies to use as a guide sometimes – but I was sometimes able to get the tune without them. I stopped listening to banjos concentrating instead on fiddle, mandolin and tenor banjo versions of the melodies. Almost everything I learn is by ear now and almost every tune will inspire me. My weakness is that I don’t take “correction” well from other banjo players that have a very different claw hammer style than me and seem to think that I should play more like them. The fiddle players seem happy with my style. So thanks for the article it may get me to consider a wider point of view – try suggestions out and give them more of a chance. There will be good feedback out there from unexpected places. Thanks for your comments, Daniel. Very well said. And I definitely think everyone should make the music they want to make. I think the balance is being open to any and all sources of inspiration and, when inspired, see how you can make it your own. Another excellent article! I’ll have to get a copy of that book. Hi Josh, tengo 72 años, y hace unos 5 compré mi primer banjo, sin saber absolutamente nada de ese instrumento, sólo que me gustaba muchísimo. Desde niño toqué el piano, aquí en Buenos Aires Argentina, no hay profesor de banjo, todo lo aprendí por videos suyos, de Rick Mckeon, Ben Clark, William Nesbbit, y otros, siempre gratis. Hoy ya tengo 5 banjos,( One Deering Special open back que uso con usted), toco tres dedos y clawhammer, y ya toqué en el festival argentino de San Pedro Country Festival, el más grande del mundo fuera de USA, ( concurrieron en 2016, más de 25000 fans de la country music and 26 bands). Puedes verme en Facebook como José Luis Gomez o como Banjo JL. Te mando un fuerte abrazo and God Bless You, José Luis. Hi Josh, I’m 72 years old, and about 5 I bought my first banjo, knowing absolutely nothing about that instrument, but I really liked it. Since I was a kid I played the piano, here in Buenos Aires Argentina, there is no banjo teacher, I learned everything from videos of him, from Rick Mckeon, Ben Clark, William Nesbbit, and others, always free. Today I already have 5 banjos, (One Deering Special open back that I use with you), I play three fingers and clawhammer, and I played at the San Pedro Country Festival in Argentina, the largest in the world outside the USA, (they competed in 2016 , More than 25,000 fans of country music and 26 bands). You can see me on Facebook like José Luis Gomez or Banjo JL. I send you a big hug and God Bless You, José Luis. Thanks for the info and I’ll have to pick up Mr. Martin’s book to read. were no real teachers. I continued playing 3-finger style for about 18 years. I then put it down for about 20 years. I have recently picked it up again and I’m learning clawhammer. I would consider myself someone with a “little” music talent. My whole family played instruments. Mine was a trumpet. I’m loving clawhammer and I now practice\play over an hour a day. I even sit in with a “rock and roll” band once in a while. I love your playing and also selection of songs. Thanks a lot !